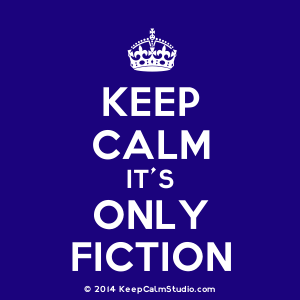 the crime segments: Happy Birthday, Agatha Christie!!! In honor of Agatha Christie's birthday, and as a part of the Agatha Christie birthday celebration at Mysteries in Paradise, I offer my most heartfelt thanks to this incredible woman for making me a mystery/crime fiction lover, and for providing me with endless hours of entertainment over the course of a lifetime. There is no other author about whom that is true. so beware knaves and murderers all! Thanks for this Nancy. 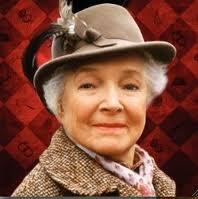 I like Jane Marple too. Nancy - What a wonderful limerick! How very creative :-). I'm impressed. 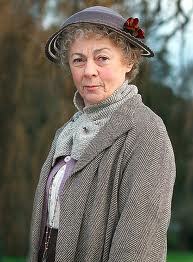 And I like Miss Marple very much, myself. What a great ode - it captures Miss Marple so well. I can never decide which I like best between Miss Marple or Poirot, but Joan Hickson portrays her the best for me. Wow! This was great!! I loved it. Margot: I thought and thought and thought about what I would do, and at the time I had been looking at some old books my daughter had left in the garage. I came across one with limericks and thought ...well, that would be different! It took me days and days to come up with this. That's one reason I haven't posted here for awhile (among many). If I could really write, that would be even better! Margaret: thank you! I am a huge fan of Miss Marple and I love Joan Hickson, so I put her picture at the top. Nan: Great, I don't know, but I definitely had fun doing it! It's so out of the ordinary for me! But you left off my favorite Jane Marple - Joan Hickson. Oh no you didn't, there it is at the top. Sorry I overlooked it. My bad. No worries! She's at the top because she's my favorite! !